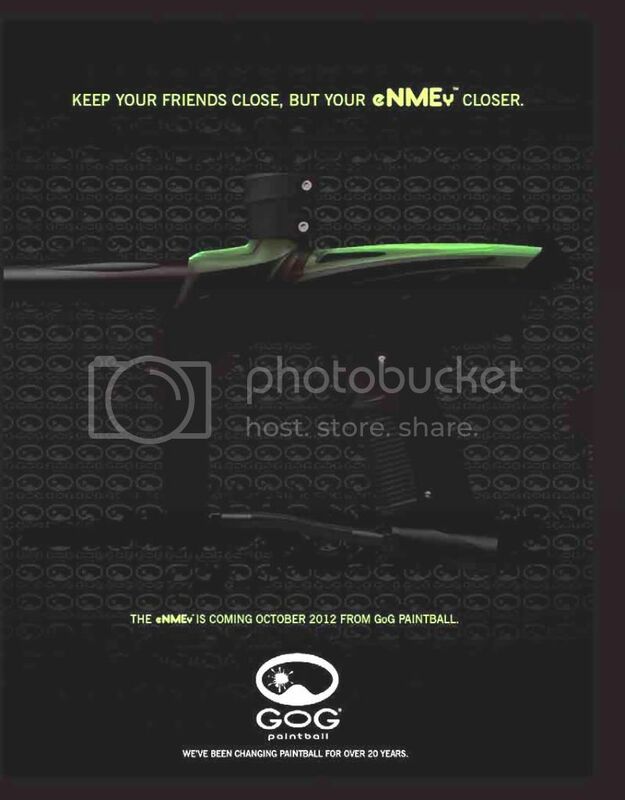 "Now, the creative minds behind the Shocker and Ion are changing the face of paintball again with the eNMEy™. With a purely pneumatic design, the eNMEy™ is a regulated spool valve marker in the same price range as entry level blowback paintguns. There's no hammer, mainspring or sear in the eNMEy™. You've got to shoot it to believe it," says GOG's Adam Gardner, referring to the smooth performance made possible by the marker's spool valve design. "That's why we're inviting paintball techs from around the world to take the eNMEy™ tech class free of charge at this year's World Cup – and to leave with an eNMEy™ of their own."" The GOG eNMEy is set to be released in October of this year, and appears to be a mechanical version of the Smart Parts Vibe/GOG eNVy due to the apparent single trigger. My name is Nate, and I've been playing paintball for over three years. This is my blog, where I write about paintball markers, events, strategies, and more. Pew pew pew! Gone Paintballing Blog was started in January of 2012. It is a paintball blog focused on the ever growing sport of paintball. It features paintball news, reviews, and more. Information and reviews on paintball markers and paintball loaders. Featuring paintball guns such as the Bob Long G6R and Invert Mini. Event coverage and videos, as well as tips and paintball techniques. We strive to keep our paintball information relevant, up to date, and free of factual and grammatical errors. If you have any suggestions for what paintball event or paintball gear that should be written about, feel free to comment with suggestions. Always remember to keep your paintball mask on at all times when playing, and stay safe! Gone Paintballing Blog - News, Reviews, and More. 2012. Powered by Blogger.